The lure of cheaper operations and the desire to look better sends unknown numbers of Americans abroad each year for cosmetic surgery. What many don’t anticipate is sub-par care and needing follow-up work that ends up costing as much or more than if they’d originally had the procedures in the United States. I spoke with cosmetic surgeons around the United States to see what kinds of overseas procedures they commonly correct and their assessments of the risks of having surgery done abroad versus in the United States. The number of corrective procedures they report doing are estimates. Answers have been edited for clarity and brevity. What Needs Fixing. The most common problem is that the work has been done poorly. This often results in various complications, such as scarring, issues with symmetry, nerve weakness, and more. Part of the art of plastic surgery is hiding incisions. Many surgeons may take the wrong approach to this and result in scars that are more visible. Asymmetry may occur when one side of the face looks much bigger or smaller than the other, or the face may be crooked. Risk Assessment. It really depends on the situation. Sometimes we will need to do a fix that is unique to a specific country abroad, and other times it may be because something was done poorly here in the United States. Some common issues are rhinoplasties done in Asian countries where silicone, plastic, or others implants are put into the nose that should not have been. These later need to be removed due to infection. Also many facelifts done in Mexico or South America have unusually placed scars that are not hidden well. Misconceptions. Patients do not realize how much it may cost them in the future to fix all the damage that has been done. You may pay less at one point, but it can be much more costly when complications arise. What Needs Fixing. The most common issue I deal with is patients who are unhappy with their breast surgery. I see patients whose implants were not placed properly, leading to an abnormal breast shape. I have also seen patients who have very poor scarring after breast lifts because the surgeons used big stitches on the outside of the breast—something most plastic surgeons in the United States would not do. Risk Assessment. Many of the problems that I fix are also issues I have to address with surgery performed in the United States. 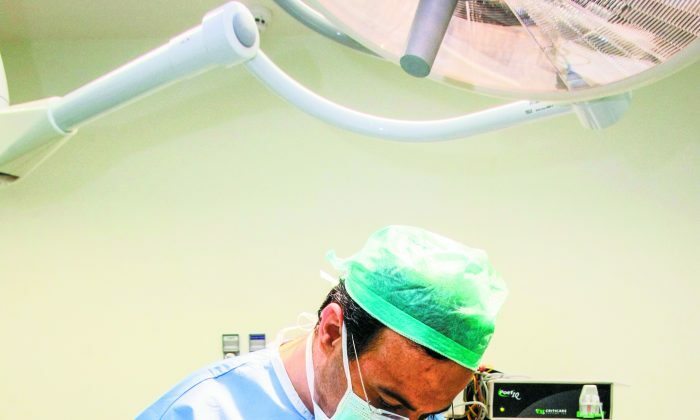 However, there does seem to be a trend of surgeons outside the United States using more rudimentary techniques, which result in patients having revision surgery that they might otherwise not need. Misconceptions. The biggest misconception is that you can travel to a foreign country for a few days, save money on your surgery, and come home with a great result. The fact is that there is a recovery period. In my practice, patients are seen one day, one week, one month, and three months after surgery. This is time for the doctor to assess them and make sure everything is progressing normally. It’s also the time for patients to ask the surgeon questions. This is possible over the phone, but the fact is you get more information when the surgeon is in front of you doing a live assessment. People also forget that complications are part of surgery. Once you leave that foreign country to come back to the United States, who is going to manage your infection, wound-healing problems, or implants that drop, get hard, or rupture. Frequently other minor revisions need to be performed in the office to improve upon the result. These issues are generally covered when your own surgeon does it. But for the patient who had surgery done outside the United States, that would mean flying back and forth. The cost of any kind of real follow-up could easily match or exceed care in the United States. For patients who decide to find a U.S. doctor to fix any issues, they are going to be charged for this service—again adding to their bottom line. What Needs Fixing. I most commonly fix poorly placed or infected nasal implants, persistent fatty or bulbous tips, and scarring. Risk Assessment. I don’t think it’s an issue of poorer care but of rhinoplasty surgery being performed by inexperienced surgeons. Misconceptions. Prospective patients are not aware that the licensing conditions for plastic surgery abroad differ vastly from those in the United States. There is a consequent danger that customers will focus on the promised outcome and the apparent cost savings, rather than analyzing the medical facilities and surgical competence of the team conducting the procedure. Patients also do not think about the fact the complications could arise from their surgery once they are home or even immediately following surgery. When a patient chooses to have surgery in a foreign country, aftercare for their cosmetic procedure is most likely not included. Because medical standards vary abroad, you may end up leaving the surgical facility without being fully recovered. Last, in the event that a complication does arise, most travel insurance policies will not cover the cost of repatriation or restorative surgery since traveling for the purpose of surgery or medical treatment is usually a disclaimer for all but a specialist. What Needs Fixing. Patients usually come requesting a revision surgery to amend or correct the outcome of a procedure they had in another country: asymmetry after breast lift or augmentation, ruptured implants, scars corrected from a tummy-tuck procedure, and ripples or asymmetry following liposuction. Risk Assessment. In general, these are common revisions sought by patients who’ve had procedures in the United States. It’s not that the patient care is poor or lacking, but it doesn’t go as far as it should to give patients the best outcomes. … It’s more of a case of the quality of the products used or the depth of skill of the provider. There are some cases, however, where the breast implant you are shown is merely a high-quality show-piece. You receive a lesser quality implant and have no idea. A surgeon in a foreign country may offer breast augmentation for $1,000, but the procedure is done by a veterinarian or general practitioner who may have medical training, but not the proper credentials to perform plastic surgery. Other cases reveal that some procedures may be done under local anesthesia when that is not the best option for the patient having this type of surgery. Misconceptions. Common misconceptions include that the equality of the procedure, products, and facility are the same as in the United States; the training of the doctor and surgical staff are equivalent; and that your safety and well-being are a top priority. What Needs Fixing. The most common problems are infection, dead tissue, and inferior or incorrect products. Risk Assessment. All of these problems can happen in the United States and abroad. These problems are seen more in surgeries abroad. Misconceptions. Consumers often think that the surgery, surgeon, and facilities are all created equal. Many consumers feel that surgery costs less abroad due to less regulation. There are fewer regulations to deal with in some countries, but oftentimes, the most basic standards for care are not maintained. Most patients report they would have preferred to recover in the comfort of their own home. Oftentimes, patients feel that recovering away from home was stressful. Cosmetic surgery has become so commonplace in our culture that consumers have forgotten it should be taken seriously. These procedures are completely elective and can enhance one’s life. On the flip side, complications can ruin one’s life. What Needs Fixing. Uneven liposuction, poorly placed tummy tuck scars, and uneven breast implants. Risk Assessment. Unfortunately, these are the results of poor techniques and can occur in any country—as every country has bad surgeons. The other complications that are more specific to overseas surgeries can be more serious. These include infections from bacteria that we do not commonly see in this country. These can be difficult to treat because we may not be easily able to identify the specific bacteria and we may not have the antibiotics to treat the infection. Some of these infections are so serious that they require surgical intervention to remove the infected tissue. These complications are also difficult to treat because they present to us much later. It is common for a patient to have early signs of infection a few days after surgery, but the overseas doctors either ignored the signs or did not recognize the signs. More importantly, patients typically travel home from overseas surgery about a week later, with no plans for additional medical care. They may develop a problem weeks later but do not see a doctor either because they have no money for proper follow-up care or simply have no idea that a serious problem is brewing. They often end up in our emergency rooms extremely sick and when it is too late to prevent a major complication. Misconceptions. The common misconception is that patients will receive the exact same surgical results in another country, but for a fraction of the cost of a U.S. surgeon. It is true that the cost is usually one-fourth of the cost in this country, but it is not simply because of a lower cost of living as many claim. It is cheaper because there is less oversight, fewer regulations, less-expensive equipment, and poor supplies, and there is no follow-up care. Readers should be aware that the decision to have elective plastic surgery is much more than about cost. These are serious operations with potentially fatal complications. Yes, complications can occur anywhere, but when they occur overseas, treatment may be delayed, and a minor complication can become life-threatening. What Needs Fixing. Rhinoplasty defects are most common. I often see Asian patients who have received rhinoplasty abroad that has resulted in scarring or collapse of the cartilage or a scooped-out nose bridge. Sometimes these patients have undergone several surgical procedures in an effort to correct problems with the first surgery. Often the additional surgery only compounds the problem, leaving the patient frustrated. These defects are often correctable using filler injection. The injection saves them from going through the expense and risk of more surgery. It’s tough to correct their noses completely, but the improvement that I can make has a big impact. Risk Assessment. Sometimes there is less quality control of the surgeons abroad. Also, in cases where an American goes abroad to get a procedure done, the normal follow-up visits are not possible. The kind of post-surgical aftercare that is an important way to avoid adverse outcomes in the United States is missed in medical tourism. Misconceptions. A major misconception is that all surgeons are the same. The fact is that the medical education in the United States is more rigorous, the training is more complete, the surgeons come out of training with more experience, and the certifying examinations are often more difficult than in many other countries. The laws governing who can operate and the condition and cleanliness of the operating rooms are also more stringent than in many countries. • A beautiful website does not equal quality facility, procedure, surgeon, or products. • Missing information on the doctor, anesthesia, or certification of the facility is a red flag and should be looked into. • Do extensive research and get patient and business references for the doctor and the facility. • Am I basing my decision on credentials of the doctor or the price? • Is this sounding too good to be true? If so, it probably is. • What results do I expect from my procedure? • Are my expectations for results realistic? Has my doctor guided me in this regard or does he or she agree to anything I ask for? • Have all my questions been answered? • How will my immediate and long-term aftercare be handled?